/ What’s the best punch bag for your home gym space? What’s the best punch bag for your home gym space? Introducing a punch bag at home and some boxing exercises to your gym routines are a great idea for increasing fitness. They aren’t just for boxers and professional fighters though – you’ll definitely get some benefits even as a home gym enthusiast! In this article I’m looking at the best punch bag for the home gym – there’s lots to think about! 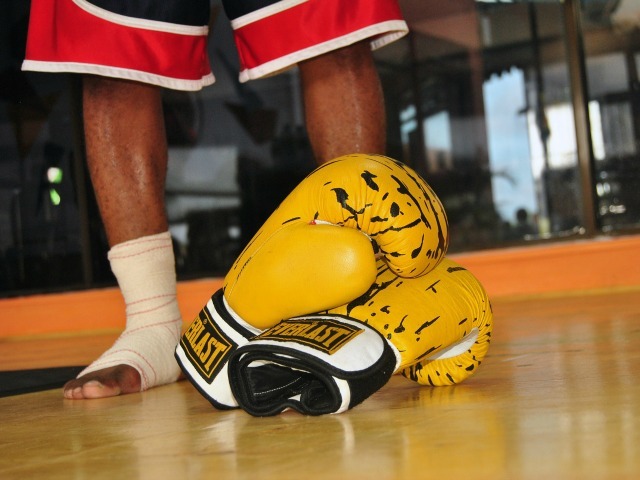 1 Why is a punch bag a good addition to a home gym? 2 What to consider when buying a punch bag? Why is a punch bag a good addition to a home gym? Punch bag training is an excellent cardiovascular activity and is can get your heart pumping in a great way. It’s a fun exercise too and if you suffer from a stressful job or just get stressed out in general then boxing can be a great stress reliever. What to consider when buying a punch bag? There are different types of punch bags which of course lend themselves to different workouts so first thing is to decide what you want to gain from having a punchbag. Cardio workout? A heavy punch bag is probably what you want. If you want to increase your endurance, burn lots of calories and increase your punching accuracy then perhaps a speedball will be what you want. Think about where you’re going to be doing your workout – can you hang a heavy boxing bag or will you need a stand? Do you have enough space to allow range of movement around the bag? 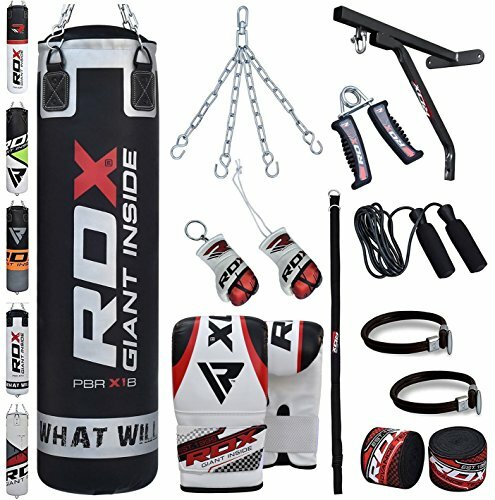 I think that the two best ideas for a home gym punching bag are the heavy punch bag and also the speedball boxing bag. These will give a good range of exercise to get your body moving and are a great start to getting you in to boxing as a fitness routine. These are the best I’ve found in the UK right now, but if you’re here from another country just click on the pictures to see if it’s available where you are. I have a couple of options for you here. One is a set that will be perfect if you’re just starting out and need a lot of equipment and the other is just for the punch bag which is also a good choice if you want to get everything individually. This set is an excellent beginners boxing punch bag. You’ll get everything that you need to set up your heavy bag punching station in it, from a bracket to boxing gloves and even hand wraps. It is a waterproof bag so can even be put outside if you don’t have space inside the house which is a massive plus for me. You could even store the bag in a shed/garage and bring it out when needed, but if you forgot to put it away it won’t ruin it. For the price and what you get with it I can highly recommend this one – it also comes in two sizes, 4ft and 5ft. See Amazon for the latest prices and reviews. If you just need the punching bag then this one is a good option coming well recommended. It’s a 5ft bag that weighs 25kg and so would be perfect to go on the stand below. A heavy duty chain at the top allows it to be hung from a bracket or a stand. If you’re looking for a heavier bag, you can also add more weight to this one at the zipped top – up to 70kg. Overall a really good quality bag for a good price. Check out this punch bag on Amazon here. If you want a heavy punch bag but you have nowhere to hang it from and let’s face it, it needs some good and strong wall fixings then a freestanding punch bag stand is a great idea. This one from Confidence is a really good, strong frame, made of powder coated steel tubing and is suitable for heavy bags between 20kg and 40kg and there’s also a place to hang a speedball too. You might find that it needs some sandbags or weights to make it a bit sturdier and not move around so much but for the price it’s an excellent bit of kit and stops the worry about fixing it to the wall. 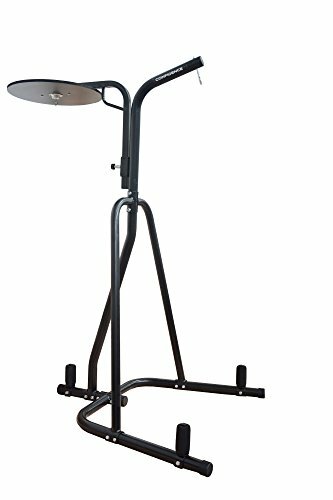 Check this free standing punching bag stand out on Amazon here. If you can’t hang a heavy bag anywhere and you don’t have room for a stand then the next best thing is a freestanding punch bag. It can be good for a small space as you can move it out of the way when not needed. 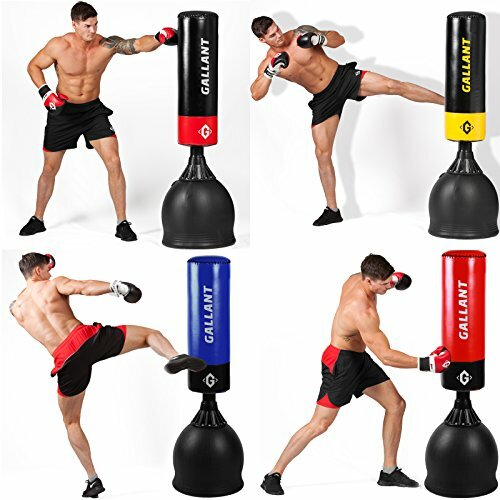 This free standing heavy punch bag from Gallant can be filled with water or sand. Water might not give it quite the weight you need to stop it travelling while using it, but while you’re figuring out the best place for it, it works quite well. When you’re sure where to put it, fill it with sand and it will stay put! You can kick or punch the bag and as an alternative to a heavy bag it’s a really good option. Made of leather it will last a long time no matter what is thrown at it! Check out this stand up punch bag on Amazon here. This is a really good value boxing speed bag. It’s made of leather, and has an inflatable bladder inside. You pump it using a football pump to the desired level, hang it up and let rip! It comes with the swivel, which is the fixings that it needs to hang on. This helps it have a good rhythm when it bounces back towards you. 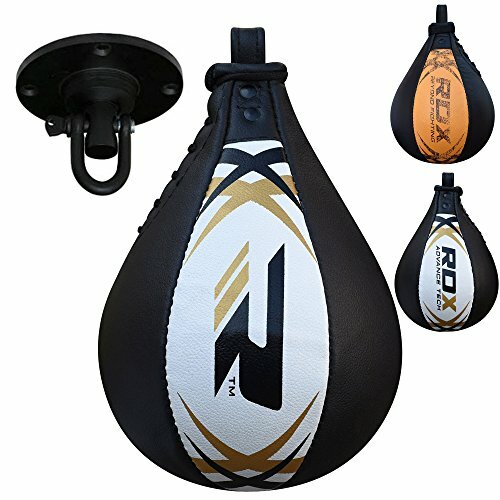 Check this speed bag out on Amazon here. I hope you’ve found this guide to the best punch bag for home helpful. Whether you’re looking for a heavy boxing bag or a light speedball, I really think it’s a great addition to any home workout. The best spinning bikes for home use 2019 – cardio time! What’s the best weight sled? What are the best battle ropes to buy?